We’d love your help. Let us know what’s wrong with this preview of Seedfall by Robert M. Campbell. To ask other readers questions about Seedfall, please sign up. I've read the first three books in this series and have quite enjoyed the story thus far. Looking forward to book four. I understand there will likely be a total of six in the series. The writer is very capable and these stories are my favorite genre, in that they are character driven, combined with hard science fiction. I guess I couldn't ask for more. The science is certainly believable and there are many threads occurring simultaneously to keep it interesting and somewhat of a page turner. You I've read the first three books in this series and have quite enjoyed the story thus far. Looking forward to book four. I understand there will likely be a total of six in the series. You get a good understanding of how difficult everything is in space. It sure ain't like the Starship Enterprise. I suspect it's a lot more work for authors of hard science to write their books compared to the typical space opera where anything works that they say works. Hard science requires research and at the very least it has to be plausible, and so far this series is spot on. Book one and two are basically one large book with a cliffhanger at the end of book one, so you really need to get both books. Book two moves nicely into book three. I started this series thinking it would be wrapped up in three installments. I was wrong. Though I have not seen any indication of a fourth or fifth book to continue and wrap up the story, I have to think that the author is just chilling after a busy year, ready to lay the big finish on us! Gave this a four star because of no finish to story at end of third book. Even though could tell after first chapter of third book there was no way the author was wrapping all of the Dang! What happens next!?! Full disclosure, I received this book from the author in exchange for a fair and honest review. Seedfall brings us down to Mars and gives us the perspective of those who live on Mars as well as a spacer returning to Mars to convince the ruling elite that there is a big problem and action needs to be taken fast. Characters from the first two stories are joined by those who live and work on the surface and within the settlement proper. The phrase, "Safe at home" has no meaning here. Something has i Full disclosure, I received this book from the author in exchange for a fair and honest review. Seedfall brings us down to Mars and gives us the perspective of those who live on Mars as well as a spacer returning to Mars to convince the ruling elite that there is a big problem and action needs to be taken fast. Characters from the first two stories are joined by those who live and work on the surface and within the settlement proper. The phrase, "Safe at home" has no meaning here. Something has impacted the surface and is causing havoc. Riots have begun in the city and the manufacturing block has gone on lock-down. Bad timing, or are they connected? Mr Campbell has done a great job of showing us how things can fall apart when just a few constants in our lives are taken out of the equation. He shows us fear and he shows us heroism. And somehow the two are closer together than one might think. I care about these characters and I want to know how it all resolves. With luck, this isn't the end of the Human Race. If you haven't read books one and two yet, do so. Then come back and read Seedfall. Interesting characters, realistic action and a plot that will keep you hanging on. I highly recommend it. I love this series. In books 1 and 2 the focus was on the trials and tribulations of the crews of New Providence's spacecraft, and the threat of destruction by an unknown object. 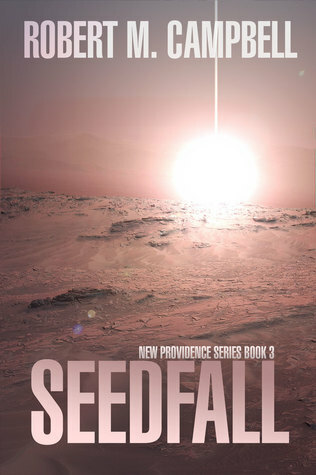 In book 3, Seedfall, the story throws a curve and focuses on the colony itself when an object crash lands on the surface of Mars. The colony itself is already having problems, food and water shortages not the least,but also from a dangerous cult in the colony's darker underbelly. In Seedfall, there are some surprise char I love this series. In books 1 and 2 the focus was on the trials and tribulations of the crews of New Providence's spacecraft, and the threat of destruction by an unknown object. In book 3, Seedfall, the story throws a curve and focuses on the colony itself when an object crash lands on the surface of Mars. The colony itself is already having problems, food and water shortages not the least,but also from a dangerous cult in the colony's darker underbelly. In Seedfall, there are some surprise character reveals, and the pieces of what appears to be the endgame of the series are placed on the board. The fact I have to now wait for book 4 is the only downside in this review. Rob's writing is crisp, and his factual style of writing about space travel is great. Characters are nicely portrayed and no one is black and white good or bad, which is nice. I have nothing to complain about here at all. Ending not satisfactory. Left hanging. Another book not mentioned. What happened to the people in RV 2. What happened to the rest of the characters in this story??? Another book please!! This was a waste of time. The story is so slow and the characters are beyond stupid. The machine could have taken out the colony in a heart beat but is less than intelligent? The smart thing would only have been a 20 page story I guess. Entertaining read, but didn't feel finished. Read this directly after finishing Trajectory Book 2. In this book the focus shifts to the city of New Providence (away from the space ships as in Books 1 and 2), which was entirely unexpected, but I ended up enjoying it after getting over the jarring aspect of it. The overall story was good, with likeable characters, although the relationships between some of them seemed a bit forced. The journey continues and there are many twists and turns in Seedfall as we move from scene to scene with the different characters. You are made to wonder what is happening when you are transposed from the City to the RV looking for what created the blast and then up to the Station where all this is being monitored. Lots of intrigue and you imagine what comes next and it's a surprise. It's a good read that forces you to think and will we ever know where we are going? Will there be more?? Let's wai The journey continues and there are many twists and turns in Seedfall as we move from scene to scene with the different characters. You are made to wonder what is happening when you are transposed from the City to the RV looking for what created the blast and then up to the Station where all this is being monitored. Lots of intrigue and you imagine what comes next and it's a surprise. Robert M. Campbell hails from the east coast of Canada, having recently returned to New Brunswick after extended stays in Toronto and Ottawa. An early love of astronomy and technology led him to a career in software engineering. Robert studied Computer Science and Anthropology at Acadia University in Nova Scotia. After twenty years working in the aerospace, government and open source software secto Robert M. Campbell hails from the east coast of Canada, having recently returned to New Brunswick after extended stays in Toronto and Ottawa. An early love of astronomy and technology led him to a career in software engineering. Robert studied Computer Science and Anthropology at Acadia University in Nova Scotia. After twenty years working in the aerospace, government and open source software sectors, he has written his first science fiction novels, Trajectory Book 1 and Book 2 – the first instalments of a projected six in the New Providence Series. Seedfall: New Providence Series Book 3 is out now. Book 4 is due to be released in early 2018.